[February 22] Well the World Cup is almost upon us and I am busy trying to pack three weeks worth of clothing and my photo kit plus laptop in a manner acceptable to Virgin Atlantic. It is not proving easy... Phone calls to Mumbai (or was it Delhi) have not helped a lot either, although the guy I spoke to did his best I feel sure. Ah, well - 23 hours later I'll be able to see how well I managed with the fragile items. Never having visited Australia before I am looking forward to the tourist sights as well as the cricket, and the camera will be busy on both! This is possibly the most exciting World Cup for many years with the odds so difficult to predict. I am often asked "Who will win?" by friends and acquaintances and I have been honestly replying "It's between at least four teams". I haven't asked any bookmaker for odds and wonder what they might be. Having the competition on home soil (and by the way shouldn't England get to host it soon?) is an obvious advantage, as is playing at the end of your own season rather than coming from a cold (especially this year) winter. However, England will have excellent memories of their last trip to this part of the world so who knows..?? On the home page you will find a note about TV coverage. I have to hope the UK will receive more than one match but I suspect even England in the final might not mean more than a quick mention somewhere in the news. I do hope I am wrong! If I am right, tempting more women and girls to play the sport is a very difficult proposition... In this day and age, TV coverage is the best publicity you can get. With passport and Australian bills already in my pocket, comes the amazing news about Jenny Gunn. I say amazing for the simple reason that she has (as far as I know) played all summer in Australia - and previous summers - and if anyone had felt her action suspect, should not some comment have been made earlier? TMS (BBC's "Test Match Special" to those outside the UK) has just broadcast a pre-recorded interview with Ebony Rainford-Smith. Yes, I don't know who she is either although the voice did sound very familiar. I took the liberty of emailing them and asking about England men's captain Andrew Smith but it hasn't, as I type, elicited any correction - but then it wouldn't, would it - they are only women after all... It's a shame that this kind of error is allowed to creep into such a superb commentary service. Well, I am finally back. I say "finally" but actually the almost three weeks on the trip seemed to fly by. The only time to run slowly was the flight. I must first and foremost thank my travelling companions, Lou Colvin, the Taylor family, (Helen, Ralph and Alex - Sarah Taylor's lot that is) and Marion Collin. One could not have asked for more relaxed company! And then the players of all countries deserve nothing but praise. From the boundary, the game appeared in all cases to be played in the best traditions of cricket. The standard of umpiring, oddly mostly from one of the better known umpires, caused the occasional frown (even scowl), but I noticed nothing in any player's conduct that would have caused the match referee any concerns. Perhaps I was not looking in the right direction, but I hope not. Also most satisfactory was the ICC's clearance of Jenny Gunn's action. The nonsense that preceded the tournament was able to be forgotten and if some were hoping it would phase Jenny then they would have been disappointed. Indeed her action in withdrawing from the final at the very last moment showed she was thinking very clearly and showed great moral courage. If there was a medal for "Most Courageous Decision" then Jenny should certainly have won it. I have had a quick look at the technical notes about her assessment and must admit to being befuddled by the jargon. Perhaps they are on the 'Net somewhere if you're interested. Wasim Akram made some explanatory remarks in the commentary on the India/England game and he sounded positively jealous of the way she can turn and flick her wrist at release. His comments raised a smile, coming from someone with such a record. So much has been written (and isn't that a pleasure to see!) and the TV coverage proved much more thorough than I had anticipated. I am crossing my fingers we'll get the T20 semis and final later this year. I have watched all of the matches and have only praise for the commentary teams in the UK. While the girls did well, Akram really would be best advised to stick to what he does best (or should I say 'did' although I wouldn't fancy being 22 yards away when he has a ball in his hand even now). Nick Knight in the studio was, as ever, top drawer! Watching a game on TV after you've seen it live gives a completely different experience. The TV cameras, of course, always get the best seats in the house, and you have the benefit of replays and (sometimes) skilled analysis, but there still nothing like being there! And since returning we have the news that for the first time in its long and revered history, Wisden is to include a woman in the 'five cricketers of the year'. The first of the one-days, played at Lord's, provided the innings of the summer. 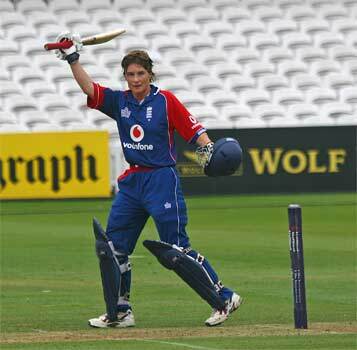 Claire Taylor's record breaking 156* from just 151 balls (picture above) was truly amazing. Anyone who can break a record set by a certain I.V.I. Richards has to be rather more than special. And what a venue to do it! And a good crowd too! Can she possibly top that in the rest of her career? I had to raise a smile when one Guardian correspondent suggested she was possibly the only one of the five worthy of the accolade. I managed a scowl however, when another in the same paper went on about "not calling them batsmen" but batters, for as regular readers (are there any?) will know I hate the term. As far as I am concerned she's the most consistent batsman in the world currently and England are fortunate to have such a player.